LIBERAL, Kan. – The Seward County Community College softball team split a non-conference doubleheader with Otero Junior College, losing the opener, 7-3, but winning the nightcap, 10-5, on Wednesday at French Family Field. The Lady Saints, who are 8-19 overall, host Barton at 2 p.m. on Saturday. The Lady Saints kept in close, but could not come up with enough offense in the opening game loss. Seward took a 2-0 lead in the bottom of the first inning. Nicole Nelson and Nissy Lechuga started it off with a pair of singles. After Jaci Oakley struck out, Madeline Owen walked to load the bases. Alyssah Pontoja fanned for the second out, but Cassandra Esquibel singled in Nelson and Lechuga to give the Lady Saints the early advantage. Otero would peck away with single runs in second and fourth innings to tie the game and eventually grabbed the lead for good with a run in the fifth at 3-2. 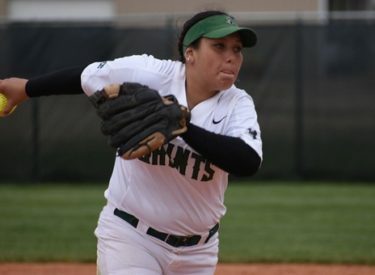 The Rattlers scored another run in the sixth, but the Lady Saints answered back with a run of their own on a Dazy Gomez homer to narrow the gap back to one at 4-3. Seward could get no closer as Otero put up three runs in the top of the seventh to take a 7-3 lead and close the scoring. Pontoja (1-7) allowed seven runs, six earned, on 12 hits, struck out one and walked one over seven innings in taking the loss. Seward used a seven-run, second inning and cruised to an easy win in the second game. All seven runs in the Lady Saint second inning were scored with two outs. After a fly out by Emily Mojica, Seward loaded the bases on singles by Jordan Cordrey and Alyssah Pontoja and a walk to Cassandra Esquibel. Nicole Nelson followed with a fielder’s choice to force Cordrey at home for the second out. Seward would not let Otero off the hook and cashed in. After a passed ball allowed Esquibel to score, Miranda Nelson drew a walk to reload the bases. Nissy Lechuga followed with a three-run double to give the Lady Saints a 4-0 lead. Jaci Oakley added an RBI double, Mojica and Cordrey had run-scoring singles to complete the seven-run inning. After Otero scored a run in the third to make it 7-1, Seward added another run in the third and two more in the fourth to open a 10-1 margin. The Rattlers closed the gap to 10-5 with three runs in the fifth and one in the seventh, but could not overcome the deficit. Lechuga went 2-for-3 with three RBI, Cordrey had three hits and Mojica added two hits, including a solo homer, for the Lady Saints, who cranked out 11 hits. Cordrey improved to 3-9, allowed five runs, four earned on six hits, struck out 13 and walked six and gave up a homer over seven innings.